Properties for sale in Brittany, France - AHIB-1-M211422 Le Quillio 22460 A detached 4 bedroomed house full of character, features and quirkiness, with a blend of old and new, renovated with quality materials with scope to change/improve to further accommodation if you wish. As this was once 2 properties, you have 2 staircases leading to accommodation from different ends of the property.I will start from when you come into the older part of the property. On entering the house you come into the older part of the house which has a beautiful entrance/reception area with a woodburner with solid oak flooring, there are also built in storage cupboards. To the left is a dining area which has built in storage/glass fronted units. From the entrance hall there is a beautiful oak staircase which takes you up 2 levels, first level to a lounge and a family bathroom with bath, whb, wc and heated towel rail and also with fitted cupboards, a bright/light bathroom. From this lounge, one of 2 or 3! !, which has a little fireplace and laminated flooring and which captures the sun most of the day, is a beautiful bright/airy room and from here there is a doorway through to a large mezzanine area which can be used as a bedroom as there is also an ensuite shower room, this area also has a gallery which looks down into the kitchen below. Back through to the lounge and staircase to upper level which takes you to a double bedroom with ensuite shower room. As we go back down to the entrance hallway, there is a door which leads you to what the current owners use as a games room, but this area can be used as a workshop, or converted to more living accommodation if desired, and there is a mezzanine floor which is used as an office, Exposed beams and stonework which are lovely features in this area. As we come back through to reception area, through to dining room and then this takes you to a magnificent kitchen, 72 cupboards!, I believe and I am sure every woman and I am sure men too! I know will manage to fill each and every one of them!, fitted white units with a central island and with fitted white goods, dishwasher, ovens and microwave. the central island has 8 burners!, so plenty space for your pans an ideal kitchen for an amateur cook/baker. Also has a larder cupboard and a dry larder cupboard. This kitchen also has a wood fired range which warms up your kitchen just beautifully, I would just live in this kitchen!!. Patio doors out to terrasse. From the kitchen, there is a doorway to the "longere" end of the house which takes you to what the owners call the library area, which has a woodburner, there is also a separate wc and a large room which is currently being used as storage but was formally a lounge area, can equally be used as another bedroom as the current owners were thinking at one point to have an ensuite shower room as there is the piping from the wc adjacent to this room. This room requires some refreshing. The second staircase from the library area takes you to a double bedroom with fitted cupboards and shutters to the windows, a smaller bedroom and a family bathroom with bath, shower above bath, double sink units, wc, heated towel rails and lots of cupboard space. 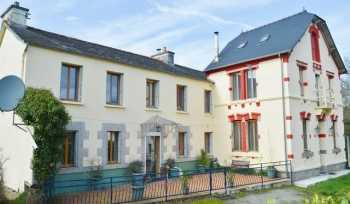 This is an ideal family home, or can be used as a b & b, with the possibility of adding further accommodation if required or changing one area into a gite, the games room area as an example. Fosse did conform in last inspection a couple of years ago, will need to be inspected again for a sale. Outside: patio, terrasse, grassed area with double gates to back of house., land of 1660m2. The DPE of this property is very good, B & A rating.